CornBot is a mobile application created by eHealth Africa in partnership with Dr. Cornelius Adewale, the Bullitt Environmental Fellow at Washington State University, to help farmers identify, detect, manage and control Fall Armyworm (FAW), a major farm pest capable of destroying more than 85 plant species including maize, rice, sorghum, and sugarcane. To enable smallholder farmers in Africa and other stakeholders such as government agencies and agricultural extension workers, to accurately identify incidences of fall armyworm in their crops. To produce timely, and empowering insights which would be useful to local smallholder farmers for addressing the incidence of fall armyworm. To reduce productivity losses caused by fall armyworm among those farmers using CornBot. To ensure the appropriate and responsible use of pest management assessments, tools, and interventions. FAW poses a great threat to agriculture and food productivity in sub-Saharan Africa as the pest is estimated to cause food losses worth over $13 billion, leaving 300 million people hungry. The pest can fly up to 1,000 miles in 30 hours meaning that it can easily migrate to surrounding farms and countries. CornBot is equipped with user- friendly audio-visual algorithms that help to identify and manage FAW in the farmers’ local languages. The app provides handy information to enable them to request help from a specialist when needed. By showing CornBot-reported FAW cases as a heatmap, the CornBot dashboard provides real-time information to researchers, decision makers and other stakeholders for surveillance purposes and informed decision making. 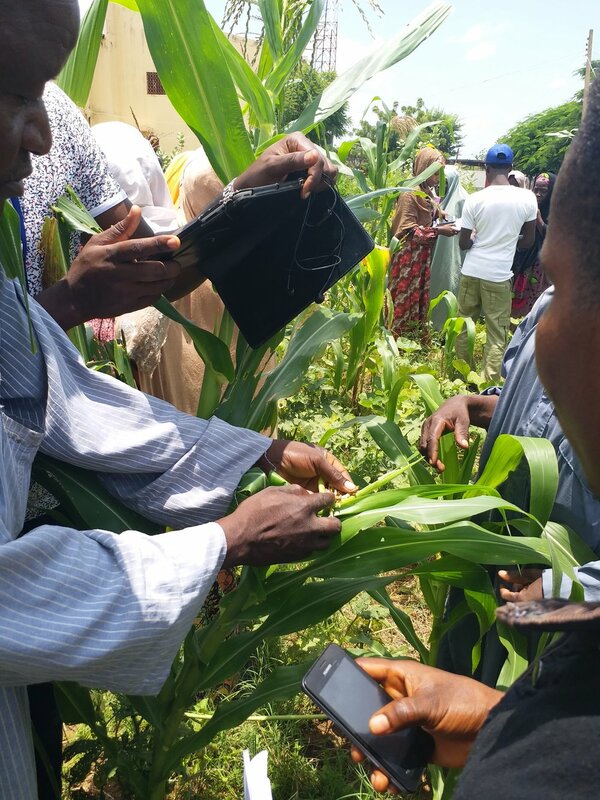 The CornBot prototype was tested to assess its usability and effectiveness among smallholder farmers in Dawakin Kudu Local Government Area of Kano State, where FAW is prevalent. The application showed positive results as all farmer groups were able to identify FAW on their first attempt, using the application. Out of 225 applications from countries all over the world, CornBot scaled through four stages and emerged as one of the six winners of the Fall Armyworm Tech Prize. At the AfricaCom awards, eHealth Africa was presented with the Frontier Innovation Award and prize money of $50,000, for CornBot. of farmers reported ease of use with the application. 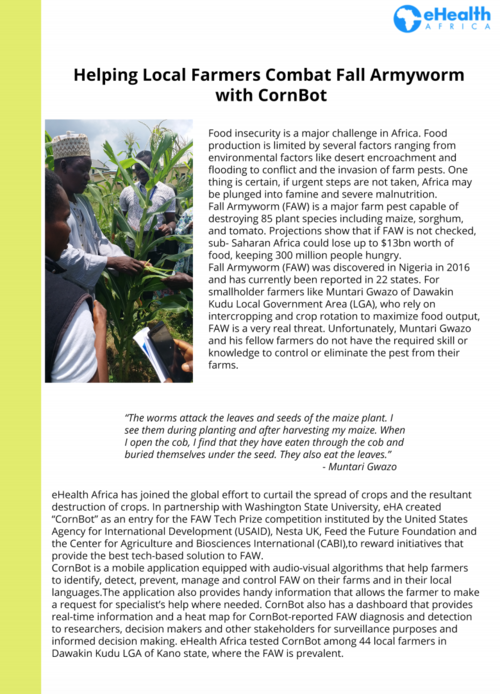 of farmers identified Fall armyworm at first attempt, using CornBot.